It's my favorite time of year again! For the eight weeks of Halloween (6 before and 2 after) I go crazy with festive spirit. This is the only holiday I can honestly say I love. Granted it's a primarily American tradition to dress up and let our kids take candy from strangers that I've frequently been told folks outside our nation tend to think is a bit pointless. Maybe that is the point though? To spend one night just doing something silly for the pleasure of it. And if you've ever spent a Halloween in Central Montana you'll know how much you have to love the holiday to go out in -3°F, wind, and snow in fishnets. But over the years there have been candy scares and our dentist even pays kids to turn in their Halloween candy which is then sent to soldiers overseas in care packages. So it got me paying more attention to the candy side of the holiday. Treats are great but do they always have to be candy? In years past our kids have received some cool alternatives such as glow-in-the-dark fangs and little plastic skeletons, pencils with pumpkin prints and eyeball squishy balls. I thought it was time I sought out some other fun and cool alternatives to candy that kids would really want to find mixed in with the Reese's Peanut Butter Cups and Skittles. Here are five great alternatives that I promise are kid approved! A favorite at weddings and baby showers mini bubbles are pretty inexpensive (comparable to the prices I just paid for candy!) and kids love them. This is one treat they can play with as they tromp from door to door or save for later. Although they are a choking hazard and should not be given to tots under 3 an older sibling or parent can blow the bubbles for the little ones to pop. This is a favorite around our home. 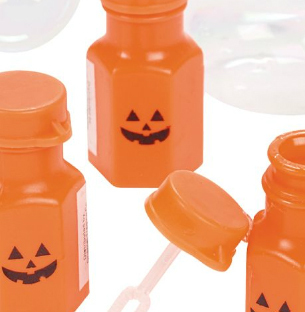 You can pick up these Mini Jack-O’-Lantern Bubble Bottles from Oriental Trading at $10 for 48 (not including shipping) or find the clear ones you find at weddings at your local dollar store and let your kids decorate them with Halloween stickers as a fun project. If you live in one of those places where it's dark at 5PM in October like we do chances are you'll be spending a couple of hours in the dark but crowded streets. Every year my mother-in-law buys a bunch of these for our kids to wear while we trick-or-treat and while they never last more than the night they're a fun favorite for our kids. While they can be a little pricey I have found them in the dollar store and Target's Dollar Spot in packages of multiples. 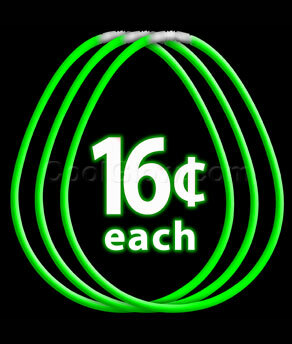 You'll likely find a better bargain online where bulk quantities are easier to come by and run lower in price. Prices I found ranged from about $20-$35 for 50 necklaces. I tend to prefer the necklaces as they can be quickly put together and put on while you trick or treat and (depending on the costume) are easily seen from all sides. 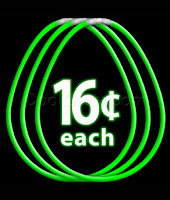 Green (shown here from coolglow.com) and purple are festive color choices but red is also really popular. Glow sticks are great as an alternative to candles in jack-o'-lanterns too! Okay, so for years dentists have handed these out to a chorus of groans from the vampires and princesses begging for sweets in their neighborhood. Hear me out! What kid loves brushing their teeth? I can't say I have ever met one. But the trick (or treat) of getting a kid to want to brush at least this one night of the year when their mouth has been the center of carameled sticky and sour-candy acid? A cool toothbrush. I've looked and there are some cool orange and black toothbrushes or ones that glow in the dark that'd be a good choice. But I found something I know my kids would find even better a week after Halloween (that won't require the purchase of an entire gross of toothbrushes). 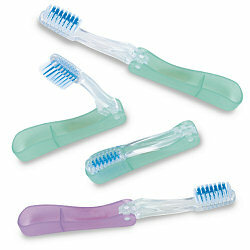 Foldable toothbrushes from Smilemakers! Not only are these compact and have the 'play with me' factor of being foldable... they come in green and purple, perfect Halloween shades. Even my tweens would dig these. Maybe it's just our family but after a frigid night out covered in makeup, spray-in hair color, and sweets a warm bath before bed is the best treat. I haven't had any luck finding what I really wanted—mini bottles of bubble bath! 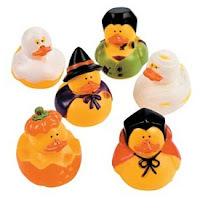 While they would be a great option (if they were available and affordable) I think a rubber duckie to play with in the tub is a cute and long-lasting favor. These are probably one of the more toddler friendly options on this list too. I've seen Halloween themed ones that'd be perfectly appropriate like the ones shown here from Oriental Trading but any rubber ducks 'in costume' will be a hit with kids. I like the Ninja, Unicorn, and Glow-in-the-Dark Skeleton ones myself but the varieties out there are vast. Save the leftovers for stocking stuffers. What can I say? I'm a practical mom. If it's fun and useful it's likely to win bonus points with me. We're a hand sanitizing family. Not to the point of excess but during the upcoming cold and flu season we're sure to be a little more attentive to hand washing, covering our noses and mouths, and wiping carts down at the grocery store. Easy to stow in pockets, backpacks, and diaper bags these are a treat most kids won't want to trade for chocolate. Plus they come in yummy scents like green apple, chocolate, carmel, marshmallow (my son's favorite), and bubblegum. These have the advantage of smelling like candy without the teeth-rotting side-effects. 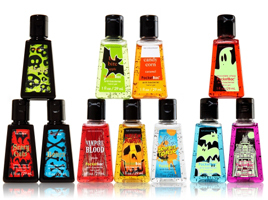 I caught the post-Halloween sale last year and stocked up on the Vampire Blood ones to giveaway on my reading blog with other vampy goodies. I'm sure other retailers have less fun, but similarly sized and easily treatable versions too. Note: I am in no way affiliated with the above mentioned companies or websites. I have received no compensation for sharing/linking these products.